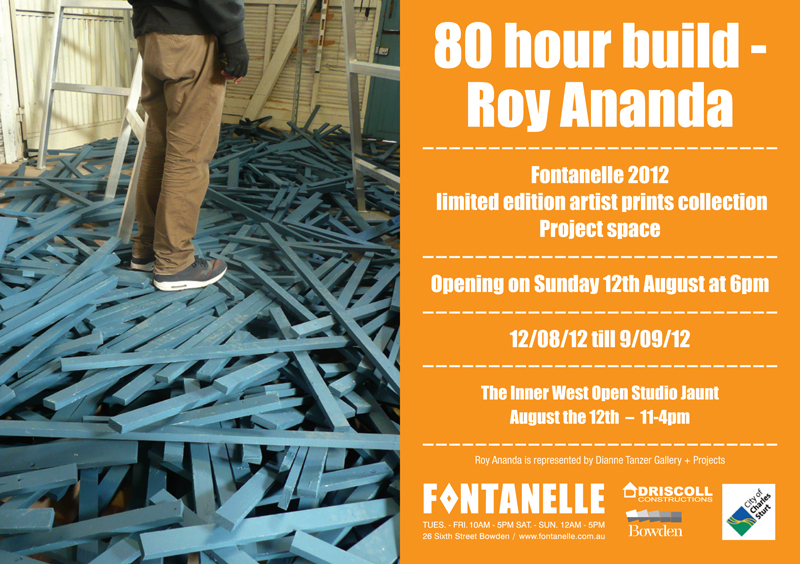 For Fontanelle’s SALA contribution, Roy Ananda will dedicate 80 hours to building a site specific installation in Fontanelle’s main gallery. Fiercely dedicated to his practice, Roy’s work will be a celebration of what it is to be an artist, and great way to honour the SALA festival. most of which will be determined in response to the evolving work. Construction of the work will commence on Sunday August 5th 2012 and conclude on Sunday August 12th 2012. The time allocated to constructing the work will not exceed 80 hours. The time allocated to constructing the work will only fall below 80 hours in the event of serious illness, injury or other extenuating circumstances. Throughout the course of the build, the work will be photographed at 20 minute intervals. This and other documentation may or may not be present in the finished work. Roy has given himself 80 hours to make an artwork. I don’t know exactly what it will look like. But I know him, his work, and the materials he will be using. He actually asked me if I wanted to spy on the process, but I declined. To look at Roy’s completed work for the first time is to see an explosion spring from an otherwise predictable combination of materials – the element of surprise in that first viewing is integral, that brief moment in time when you forget that what you’re beholding was made by a person, and instead it’s this amorphous surprise that thwarts your preconceptions as soon as you walk into the space. Even the exhibition invitation gives a sense of anticipation as we see the artist negotiating a pile of rubble that will become art, or more than the sum of its parts. From a pile of grey wood he will build a cascade of forms, which will appear almost kinetic, like a Futurist painting. His choices will involve building up and cutting away, re-integrating the cut debris like a post-apocalyptic survivor, and on that subject, his affection for science-fiction will assert itself in the work; we will see hints of this kind of arachnid, dystopian aesthetic, and recall when movie-makers created the ‘illusion’ of structure by actually making the thing (Jabba the Hutt’s floating barge existed in a desert somewhere, with actors and technicians scurrying across it). The conditions exist because new ingredients are really just a distraction from the primary thing which compels the work; that is, I believe, that the artist will derive as much pleasure from the process as his audience will from the result. 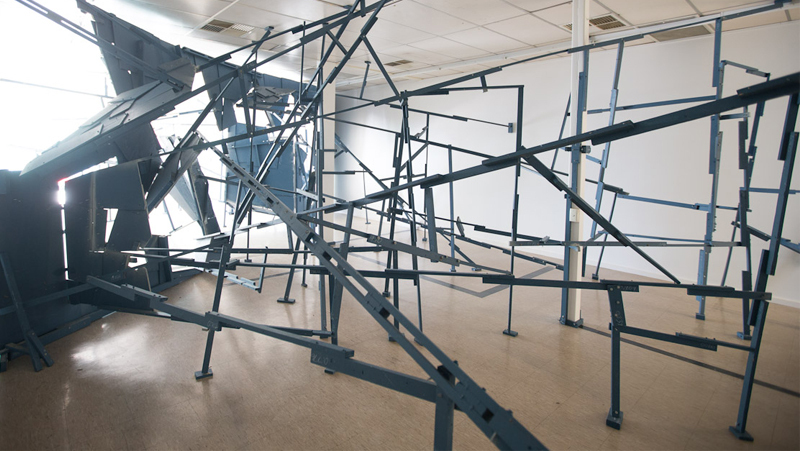 We are invited to participate in what he has discovered, made explicitly aware of how it began, 80 hours before it developed into these thrilling constellations of line and shape. The still artwork will retain its kineticism after the artist has put down his power drill, because we must negotiate with the structure ourselves, moving in and around it, engaged in the same kind of discovery as the artist was. To me, Roy’s work is an explicit rebellion against banality. He takes the materials and removes them from their usual purpose. The scribbled measurements on the grey surface of the wood recall schematic plans, as traditionally redundant as sheet music to an improv. musician (the symbols still welcome in their aesthetic familiarity – the notes or the blueprint as the artworks themselves). In the finishd work we will see a record of every spontaneous choice that was made, the suspended beams like notes hanging in the air after the track has been played out. Banality will be smashed over 80 hours and the space will retain its memory of the event for us to look at, the notes scattered, the building site half-way pulled into an ecstatic dimension of chaos.